Han Kang’s new novel mines the violent past and uncertain future of South Korean politics. In January 2009, several dozen protesters refused to evacuate a five-story building in Yongsan, a working-class neighborhood of central Seoul. They were longtime renters of small restaurants and variety stores who’d been ordered to shutter their businesses. Giant quasi-state developers, including Samsung, had bought out the entire neighborhood, slating it for redevelopment into office and apartment towers, with the city’s blessing. Landowners had been paid just a fraction of what their properties were worth, but the hundreds of tenants, even worse off, received ruinous token compensation. When their appeals to local authorities went ignored, they resorted to occupying the rooftop under a banner: Our Lives Are Here. By Han Kang; Deborah Smith, trans. Eight years after Yongsan, coinciding with the nation’s largest-ever protests and its second presidential impeachment, Han’s Gwangju novel, Human Acts, has arrived in English translation. Many readers in Britain and the United States are already familiar with 46-year-old Han, who, along with her London-based translator, Deborah Smith, won last year’s Man Booker International Award for The Vegetarian. The English publication of The Vegetarian, about a housewife’s dark awakening, felt like an event: Korean literature, notoriously difficult to translate, had finally taken on a new legibility in the West. It was received as a feminist allegory or a surrealist parable. Its weird, frugal prose (“no watery blood, no ripped intestines”) invited comparisons to Hanya Yanagihara and Kafka. The violence of The Vegetarian is domestic in scope. Yet the book resonates not only as a feminist critique but also as an exploration of human savagery—a constant theme in Han’s work, dating back to the 1990s. Human Acts is unique in the intensity and scale of this brutality. 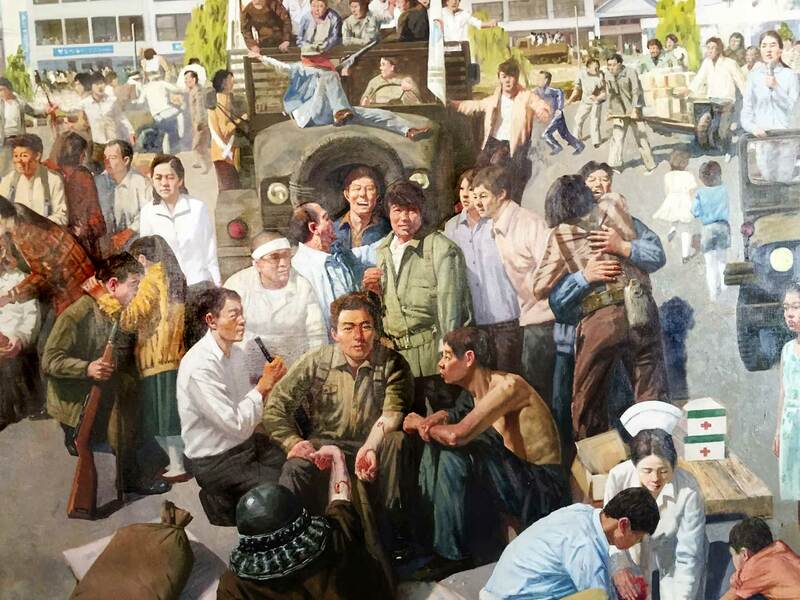 Picking the scab of the Gwangju massacre, the novel details a bloody history that was deliberately forgotten and is only now being recovered. At the time of the uprising, South Korea was a relatively young state, formed after decades of Japanese colonization and the terrible civil war of 1950–53. During the effort to rebuild and accelerate the South Korean economy, thousands of young men fought in Vietnam as US mercenaries and earned a reputation for indiscriminate killing. The country they returned to was also steeped in violence: In October 1979, South Korean autocrat Park Chung-hee—father of the recently impeached president, Park Geun-hye—was assassinated by his own security chief. A new, equally brutal strongman, Chun Doo-hwan, took control. Han was just 9 years old when the uprising took place. Gwangju was her hometown, but she had just moved with her family to a suburb of Seoul, thus escaping the impending violence. The event seeped into her nonetheless, and Human Acts is the product of this obsession. As Smith notes in her preface, “In 2013, when Park Chung-hee’s daughter Park Geun-hye was inaugurated as president, the past rose up and ripped the bandage off old wounds for Gwangju-ites like Han Kang.” Indeed, Park Geun-hye has attempted to replicate (through surveillance laws and backroom dealings) and rehabilitate (via government-sponsored revisionist textbooks) her father’s paranoid style. President Park II has now been impeached, following massive protests over revelations of corruption involving Samsung and a childhood confidante dating back to the time of Gwangju. The Constitutional Court could rule on Park’s future as early as next month and green-light an interim election. Meanwhile, the investigation has plowed up fetid soil: every government agency and private corporation, rotten from top to tail. In February, Park’s minister of culture was indicted for having maintained a McCarthyite blacklist of nearly 10,000 artists, actors, and writers considered hostile to the president. Books had been blacklisted too, severely limiting their distribution. Among them: Han’s Human Acts. Dong-ho looks for his young friend Jeong-dae, who speaks as a ghost in Chapter 2, hovering above his own discarded body. But it is Jeong-dae who finds his teenage sister and Dong-ho among the dead: “A distant scream. Living breaths snapped like a neck. Souls shocked from their bodies.” Chapters 3 through 6 trace the lives of survivors: a young woman who handled corpses with Dong-ho becomes, by 1985, an editor tasked with ferrying literature to government censors; a college student arrested and tortured in Gwangju is a taxi driver suffering night terrors in 1990; a once rabble-rousing “factory girl” shrinks into a reclusive bean counter by 2002; and, in 2010, Dong-ho’s mother still lives the nightmare of losing her son. Witnesses and researchers predominate in Human Acts, a nod to the recent historiography of Gwangju. It wasn’t until the late 1990s that the Korean government acknowledged the uprising and massacre, and the number of murdered civilians is still unknown. Activists and academics have attempted to gather official records, photographs, news reports, testimonies, and pamphlets; the English translation of Kwangju Diary: Beyond Death, Beyond the Darkness of the Age, a critical history long out of print, will be republished this spring. Han’s book, though more artful and elliptical than others in the same mode, is reminiscent of Hyun Ki-young’s novel One Spoon on This Earth, about the suppression of leftists on Jeju Island before the Korean War, and Lee Chang-dong’s 1999 film Peppermint Candy, in which the protagonist flashes back to his accidental murder of a student protester in Gwangju. In modern Korea, fiction continues to be a critical mode of bearing witness. The last chapter of Human Acts departs from the rest. Han writes an essay in her own voice, in real time: 2013. Labeled “Epilogue” in the English translation, it’s an extended version of the author afterword common to Korean novels. In it, Han reveals that she modeled Dong-ho on a real-life boy killed in Gwangju. When Han’s family still lived there, her father, the renowned novelist Han Seungwon, taught the boy in middle school; later, the boy and his family moved into Han’s childhood home. In the months after the massacre, 9-year-old Han imagines “that tiny room at one end of the kitchen, where I used to lie on my stomach to do my homework,” wondering if the boy her parents whispered about “used to spread out his homework on its cold paper floor, then lie stomach-down just as I had?” As an adult, she asks, “How had the seasons kept on turning for me, when time had stopped forever for him that May?” On a trip back to Gwangju, Han tracks down the boy’s older brother, now a graying science teacher. At first the man is reticent: “But then I thought, what would my mother have done if she were still alive?… She lived thirty years with those words inside her.… Please, write your book,” he tells Han. Human Acts is a fulfillment of this command. It appears in translation nearly 40 years after the Gwangju massacre and during another episode of state oppression and citizen outrage. Over the past few months, millions of Koreans have filled the avenues around the Blue House, the presidential residence in Seoul. As reported in the international press, the scandal that brought down Park was essentially an extreme case of old-school nepotism and arrogance. Inside South Korea, the ouster has metastasized into a months-long national audit of the entire political and economic system. While in office, Park and her cronies took bribes from massive conglomerates, outlawed an opposition party, attacked peaceful dissenters with water cannons, and attempted to destroy public-sector unions—and the president was nowhere to be found when hundreds of schoolchildren drowned in a ferry accident off the southern coast. Park is her father’s daughter, a successor to his military dictatorship, governing as though unaccountable to the public she ostensibly serves. In the final chapter of Human Acts, Han strips her hometown of its specificity, redefining “Gwangju” as a “name for whatever is forcibly isolated, beaten down, and brutalized, for all that has been mutilated beyond repair.” The people of South Korea have again lost patience and are pressing their grievances in the streets. What isn’t yet known is how the present crisis will end: Is it, or is it not, Gwangju?